Hi guys! Happy Tuesday! 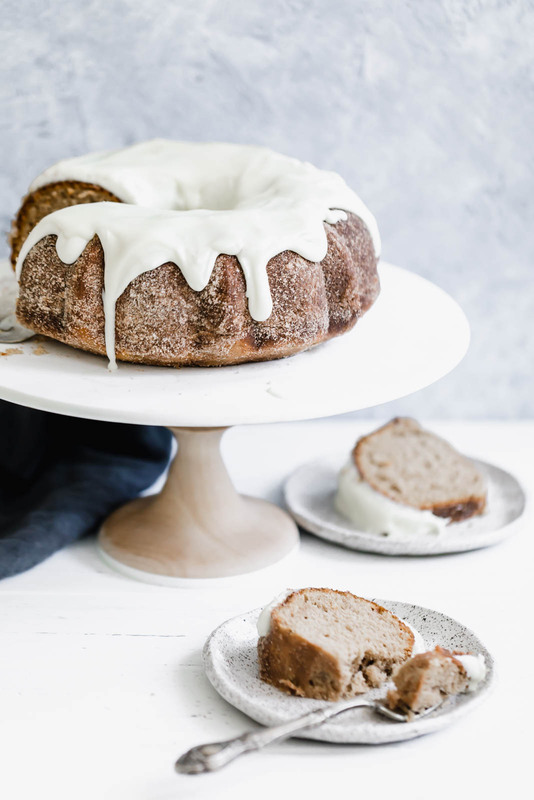 I’m so, so excited to share with you something I’ve been working really hard on… But first, let me share this bundt cake with you all, simply because it’s so damn awesome. 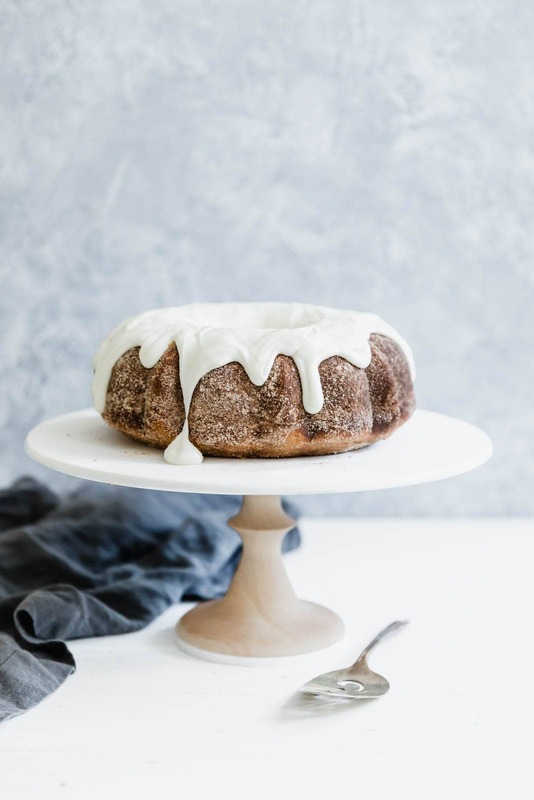 I mean, a fluffy cinnamon bundt cake coated in cinnamon sugar and topped with a thick cream cheese glaze…. what could be better?! 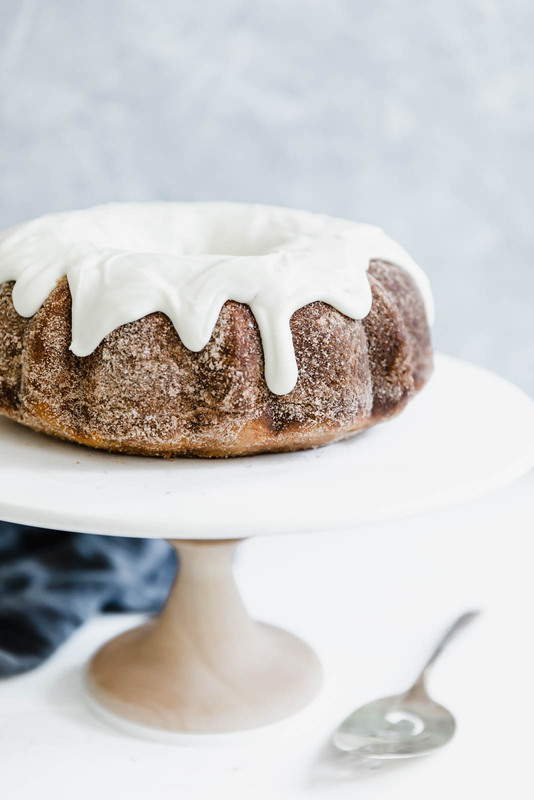 This Cinnamon Bun Bundt Cake would be SO perfect for a weekend brunch, or for a weekday snack, just because. I can’t get over the cake itself. It’s super moist and has a perfect amount of acidity for being just a cake with cinnamon in it. It’s weirdly flavorful. 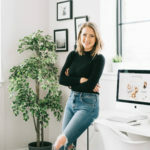 OK so onto some other news I’m really excited to share with you all: On Thursday at 1pm EST, I’ll be hosting a free, live 1-hour webinar on how I’ve used food photography to build a 6-figure online business. I’ll back up. For years now I’ve been getting questions on how I’ve built my business, and more specifically how I’ve used food photography to do so. So I decided to host this webinar on Thursday so that I can share some of what I’ve learned with you all. Are you interested yet?! If so, you have to register ahead of time—click here to register for the free live webinar. As with any of my cake recipes, it’s important that your butter and eggs are at room temperature before you add them to the batter. This ensures that the cake cooks evenly in the oven and makes incorporating all the ingredients even easier. 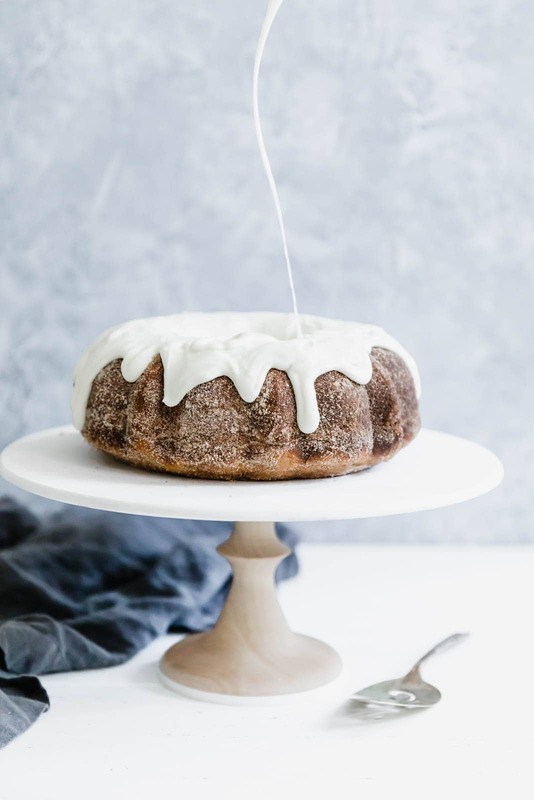 To get that perfectly fluffy-yet-dense bundt cake texture, you’ll need to whip the butter and sugar together until fluffy. You’re looking for the butter to turn slightly pale in color and for it to have a nice, whipped texture. If your butter isn’t whipping up easily, it’s possible that it’s too cold. When in doubt, turn off the mixer and let the butter sit in the bowl for 10 minutes and try again. 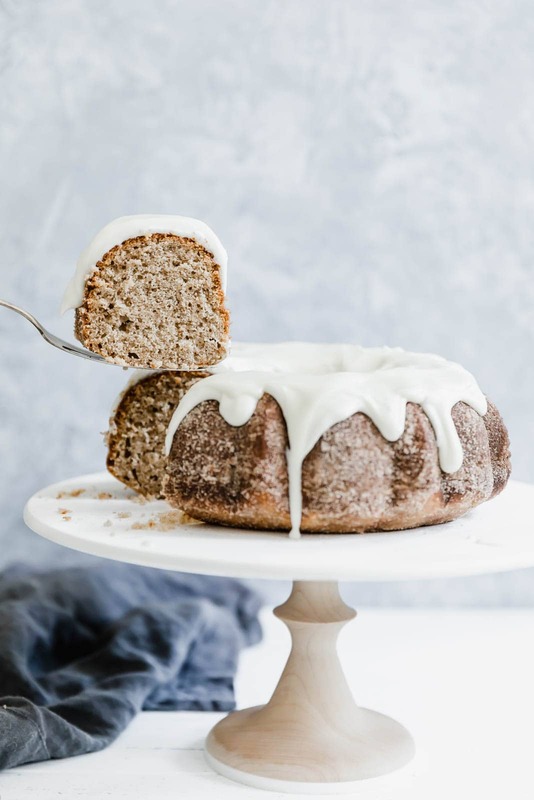 To get that tangy, almost Snickerdoodle-like flavor in this cinnamon bundt cake, you’ll need to add in non-fat plain Greek yogurt. Normally, I’m all about using full-fat yogurt to make cakes super moist. But in this case, you want the non-fat stuff as it’s much tangier and has a stronger flavor. And unfortunately regular yogurt won’t work in this recipe because it’s too runny! Besides that, baking this bundt cake is fairly straightforward. It’s a big cake, so it’ll need a good 50 minutes in the oven. Once you take it out of the oven, let it rest in the pan for at least 20 minutes before flipping it onto a cooling rack. 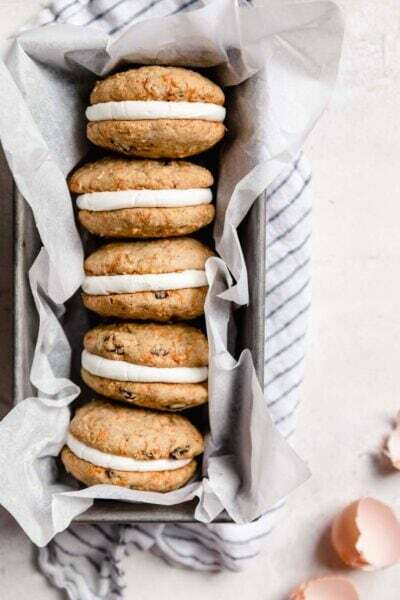 After that, it’s just a matter of adding the cinnamon-sugar topping and the cream cheese frosting and digging in! Preheat oven to 350°F. Grease a bundt pan. Set aside. In a large bowl, beat the butter and sugars together until light and fluffy. Add in the eggs and vanilla extract. In a separate bowl, combine the flour, baking powder, baking soda, cinnamon, and salt, whisking to combine. Slowly alternate folding in the flour mixture and the yogurt into the wet ingredients until everything is combined. Pour batter into prepared pan, and bake for 50 minutes, until a knife inserted in the center of the cake comes out clean. Allow to cool for 20 minutes before removing from pan. Place a cooling rack over a large piece of aluminum foil. Place bundt pan on cooling rack. In a small bowl, mix together the sugar and cinnamon. Using a pastry brush, brush the entire outside of the warm bundt pan with butter. Sprinkle the cinnamon sugar mixture all over the cake, pressing it into the cake gently. Last, mix together the cream cheese frosting. In a medium bowl, whisk all ingredients until combined. Microwave for 15 seconds, mix again, then pour over the top of the bundt cake. OOh can’t wait to try this! My husbands favorite treat is a warm fluffy cinnamon roll- bet this would make an amazing birthday cake! Can’t wait for the webinar this week!! Registered! Now I need to buy cream cheese! Oh my! It’s a giant cinnamon bun! In cake form! For breakfast! Snack! Or a treat! Too good to be true but here it is! Thank you! 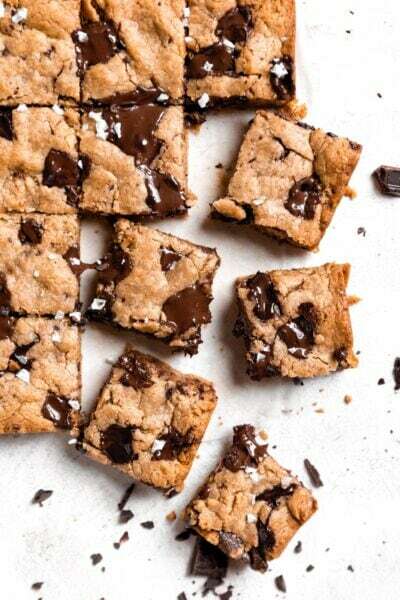 OMG I am sooooo making this for breakfast!!!! Thank you so much, Sarah!! Which size pan you used? Registered 🙂 Looking forward to the webinar! And your site is absolutely stunning! 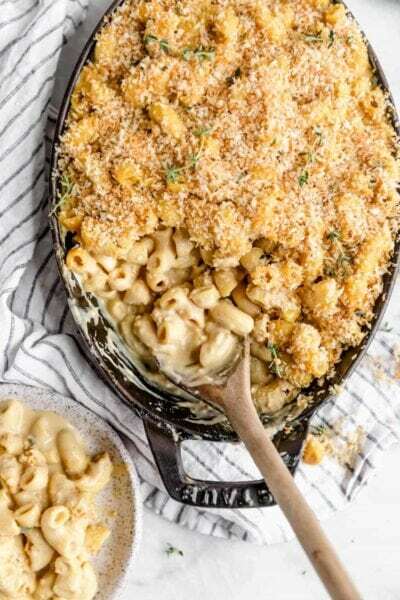 This looks great for any time but especially holiday entertaining. I registered for webinar. So excited I can watch at a later time since I cannot listen live due to work schedule. Looking forward to tips for a new career! Thanks! First: that cake looks awesome! Second: thanks for the webinar! I made this cake for my co-workers this week, and half of it disappeared within the first 20 minutes (needless to say, the other half disappeared quickly as well)!! It is absolutely delicious and moist, and has a wonderful balance of cinnamon and sweetness. Thank you, and I can’t wait to try more of your recipes!